Technical Productions Inc. (TPI) supported a pre-game event for the NFL’s St. Louis Rams by providing an Si Expression 3 console with two 32x12 stage boxes and three Dante cards, plus five BSS Audio FCS-960 graphic EQ units and four BSS Audio FDS-366T loudspeaker management processor. ‍ST. LOUIS, MO – Technical Productions Inc. (TPI) supported a pre-game event for the NFL’s St. Louis Rams by providing an Si Expression 3 console with two 32x12 stage boxes and three Dante cards, plus five BSS Audio FCS-960 graphic EQ units and four BSS Audio FDS-366T loudspeaker management processor. Having delivered audio services for all pre-game NFL events for the St. Louis Rams for the last two years, as well as other productions for over a decade, Technical Productions Inc. (TPI) again provided the audio system for the festivities prior to the team’s first game for the third season. 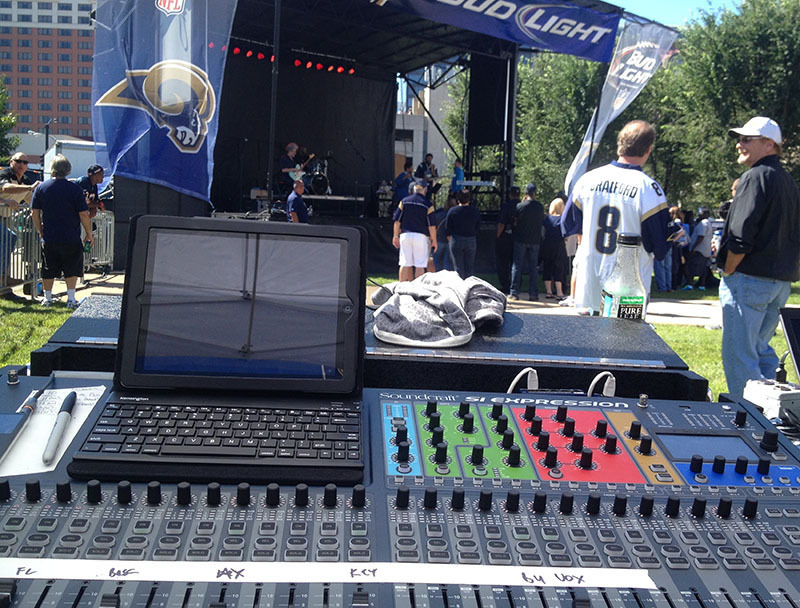 While maintaining a low budget just outside the Edward Jones Dome in St. Louis, engineers Stephen Jones and Marshall Stacy of TPI took advantage of the Harman Soundcraft Si Expression 3 console’s mixing power and BSS Audio signal processors to achieve the most compelling sound for the audience. As is typical for the Rams’ live pregame events, TPI supplies a 20x26-foot stage to complement the space. Featured in this particular event were a Si Expression 3 console with two 32x12 stage boxes and three Dante cards, plus five BSS Audio FCS-960 graphic EQ units and four BSS Audio FDS-366T loudspeaker management processor, of which two were used for the main PA’s and two for the monitors. Having the Si Expression allowed Jones, who is very detail-oriented, to maximize his abilities during a show, and with the onboard memory, no intricate setting is left unsaved. When combined with technologies from BSS Audio, Jones has everything he needs without going over the budget. For more information on Technical Productions Inc., please visit www.technicalproductions.com. 10866 midwest industrial blvd. saint louis mo 63132 | 1.800.500.1150 | 314.644.4000 | © 2016 technical productions inc.